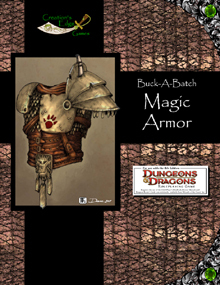 Buck-A-Batch: Magic Armor for 4th Edition Dungeons & Dragons features 25 unique new pieces of magic armor. The items are presented in two formats for your convenience: Standard item template and a card format for cutting out and handing to your players. This is not a translation of a 3rd edition product rather a completely new product for 4th edition rules. The Armorsmiths at Creation's Edge Games have gone back to the forge to craft twenty-five new weapons for your adventurers to equip themselves with. 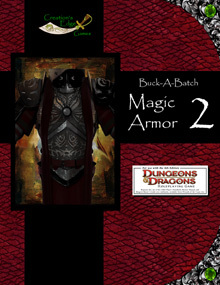 Buck-A-Batch: Magic Armor 2 for 4th Edition Dungeons & Dragons features 25 unique new pieces of magic armor. 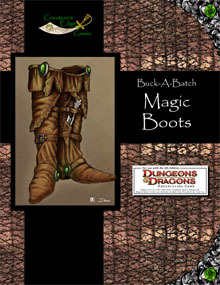 Buck-A-Batch: Magic Boots for 4th Edition Dungeons & Dragons features 25 unique pairs of magic boots. 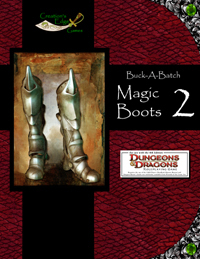 Buck-A-Batch: Magic Boots 2 for 4th Edition Dungeons & Dragons features 25 unique pairs of magic boots. 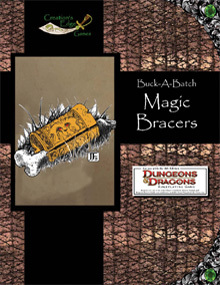 Buck-A-Batch: Magic Bracers for 4th Edition Dungeons & Dragons features 25 unique pairs of magic bracers. 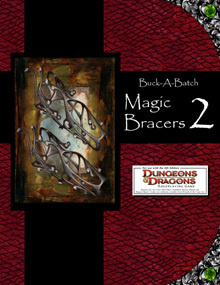 Buck-A-Batch: Magic Bracers 2 for 4th Edition Dungeons & Dragons features 25 unique pairs of magic bracers. Just when you thought you had enough magic items we cram some into your neck slot. That's right 25 new magic items crafted with your neck slot in mind: Necklaces, capes, cloaks, chokers... and we may have thrown a scarf or two in as well. 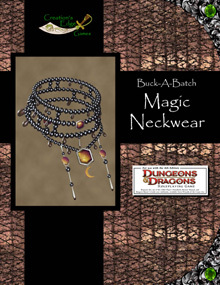 Buck-A-Batch: Magic Neckwear for 4th Edition Dungeons & Dragons features 25 unique new magic items. Creation's Edge Games presents twenty-five new magic items to cram into your neck slot. We've got your adventurer covered with some unique items designed to deal some damage, and keep their necks warm while doing it. Buck-A-Batch: Magic Neckwear 2 for 4th Edition Dungeons & Dragons features 25 unique new magic items. The alchemists at Creation's Edge Games have been working overtime. Here's their latest batch. A baker's two-dozen(?) of tasty potions sure to please... and displease your enemies. Buck-A-Batch: Magic Potions for 4th Edition Dungeons & Dragons features 25 unique new magic potions. How's that magic taste? The alchemists at Creation's Edge Games present twenty-five new potions for your fantasy campaign. Magic potions are a fantasy staple, make sure you have enough. 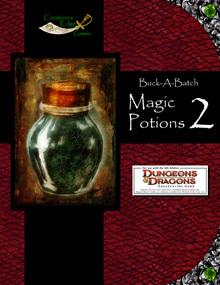 Buck-A-Batch: Magic Potions 2 for 4th Edition Dungeons & Dragons features 25 unique new magic potions. You're going to wish your character had 25 fingers... and a DM willing to bend the rules a little since, you know, you're only allowed to wear like two. And man you'd be stylin'. 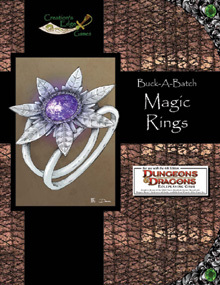 Buck-A-Batch: Magic Rings for 4th Edition Dungeons & Dragons features 25 unique new magic rings. 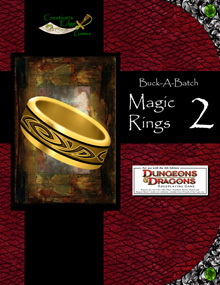 Buck-A-Batch: Magic Rings 2 for 4th Edition Dungeons & Dragons features 25 unique new magic rings. Two words for you- Headstone Shield. You're using a grave marker for a shield. How cool is that? And did I mention you can use it to summon skeletons? Now how much would you pay? Buck-A-Batch: Magic Shields for 4th Edition Dungeons & Dragons features 25 unique new magic shields. 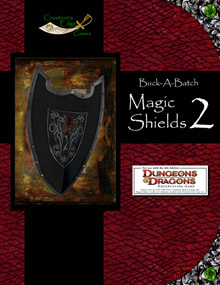 Buck-A-Batch: Magic Shields 2 for 4th Edition Dungeons & Dragons features 25 unique new magic shields. 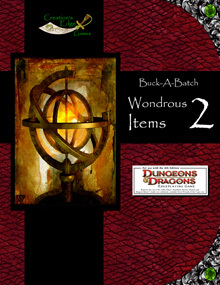 Buck-A-Batch: Magic Weapons for 4th Edition Dungeons & Dragons features 25 unique new magic weapons. More weapons? Really? Well here you go, another batch from the Creation's Edge Armory! 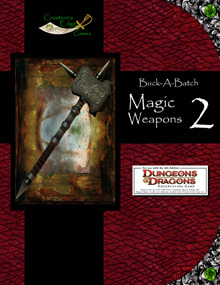 Buck-A-Batch: Magic Weapons 2 for 4th Edition Dungeons & Dragons features 25 unique new magic weapons. In Mother Russia book read you! 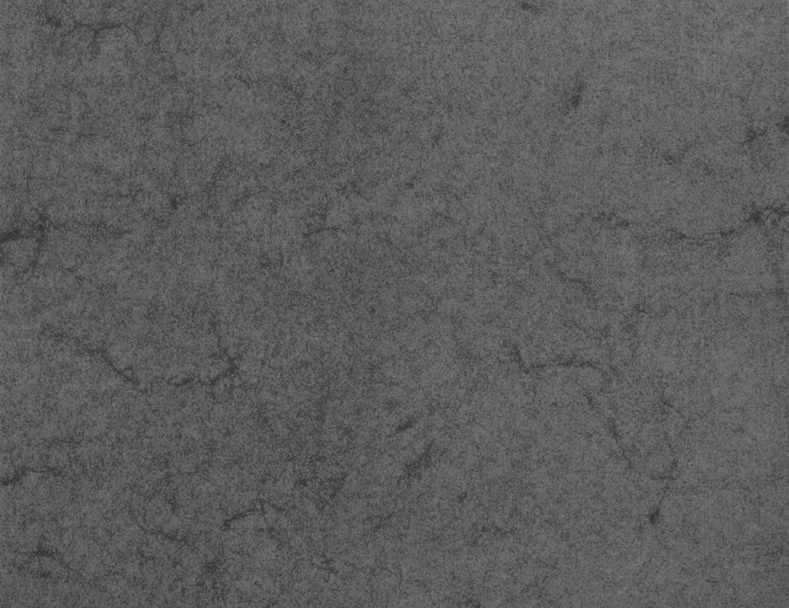 Okay the Yakov Smirnoff joke might be a little dated but seemed appropriate considering the Book of Souls has a face. 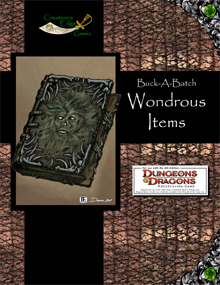 Buck-A-Batch: Wondrous Items for 4th Edition Dungeons & Dragons features 25 unique new magic items. You want Solaran's Sphere? It changes the damage a creature takes to radiant energy, then gives them either a resistance or a vulnerability to radiant damage, depending upon how lucky they are. Of course at times you get to decide which they get, hurting a foe or protecting a friend. Versitile? Yes. Wondrous? Sure. A dollar? You bet! You get 25 unique new magic weapons items, presented in two formats for your convenience: Standard item template and a card format for cutting out and handing to your players.